More than 70 years ago, a historic legislative act created the North Texas Municipal Water District (NTMWD). Our long history has been full of steadfast support from numerous legislators to help us meet the needs of our ever-growing region. The legacy began seven decades ago with U.S. Representative Sam Rayburn’s key involvement in Lavon Lake becoming a reality. Recently, NTMWD recognized the support of U.S. Representatives Sam Johnson, Pete Sessions, John Ratcliffe and Eddie Bernice Johnson, who along with Senators John Cornyn and Ted Cruz provided support enabling construction to begin on the newest major reservoir in Texas in over thirty years – Bois d’Arc Lake in Fannin County. 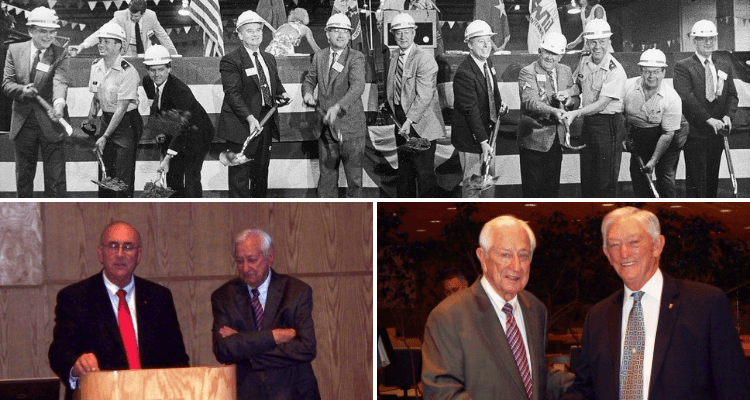 In March, Texas and the nation lost one of the most significant legislators in North Texas history and a long-time friend to the District: U.S. Representative Ralph Hall. Known across the aisles as an impeccable gentleman committed to putting his constituents first, Congressman Hall dedicated his life to ensure a high quality of life for millions of North Texans. This included making sure there would always be safe, reliable water for our region. Congressman Hall was there in the early 1980s, working with Congressman Jim Chapman and the District to get Cooper Lake built. In the latter half of the decade, he helped mediate disputes over Lake Texoma water allocations which was essential to the District’s successful construction of the Texoma Pump Station and Pipelines. One of his sons, Brett Hall served on the NTMWD Board of Directors from 1981 – 2000 representing Rockwall. And in 2012, it was Congressman Hall who led the way to regaining the Lake Texoma water supply that had been cut-off due to invasive zebra mussels. In addition to being from Congressman Hall’s home town, Director Lofland is a lifelong family friend and served as one of the pallbearers at his funeral on March 16. Director Lofland remembers Congressman Hall as a representative that was for the members of his district who would review all sides of a concern and work for the betterment of everyone in our region. “Whenever we went up to Washington to meet with him, Congressman Hall would personally take his time and do whatever he could for the District and those in our area. He was a unifier – he unified people across districts and party lines to get positive goals accomplished,” Lofland added. Congressman Hall was dedicated to the 4th Congressional District, the North Texas region and the entire state of Texas. The NTMWD extends heartfelt condolences to Ralph Hall’s family and many friends.